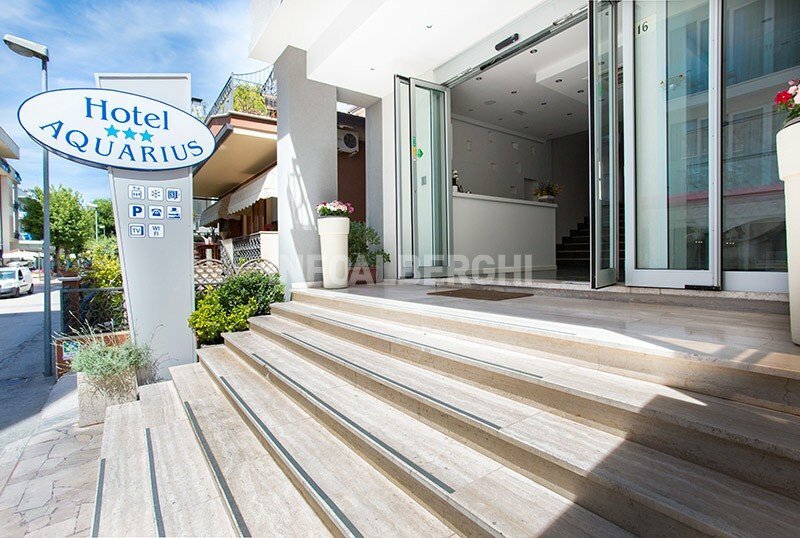 The Hotel Aquarius is a family-run 3 star hotel in Cattolica, located just a few minutes from the sea and near the aquarium. Recently renovated, it has parking, WI-FI connection and admits small pets. In Cattolica, less than 5 minutes walk from the beach and near the pedestrian area of Viale Dante, an area full of shops, clubs and restaurants. Along the nearby Viale Carducci promenade, in less than 10 minutes, you can also reach the Cattolica Aquarium, while the Santa Monica Circuit is less than 15 minutes away by car. The hotel has 38 recently renovated rooms. Each has a large balcony, free WI-FI, air conditioning, safe, digital terrestrial TV, minibar on request, completely new private bathrooms with shower, hairdryer and complimentary toiletries. FAMILIES: communicating and family solutions are available for large groups. Equipped open-air porch, free use bicycles, lift, 24 hour reception and free WI-FI connection. 2 theme nights are organized every week. PARKING: available on request at 500 m from the hotel and served as a navatta. BREAKFAST: sweet and savory buffet with biscuits, croissants, homemade cakes, cereals, yogurt, jams, cold cuts, cheese, fruit and coffee. LUNCH AND DINNER: in the Perle di Mare dining room we serve traditional dishes from Romagna, regional and national buffet specialties with a wide choice of first and second courses, side dishes, vegetables, seasonal fruit, ice cream and homemade desserts. The menu is 3 choices. Pasta and desserts are homemade. VARIATIONS: on request the staff prepares gluten-free and vegetarian dishes. In the room: cot and cot with fall protection rails. At meals: flexible meal times, baby menus and seats at the table. On the beach: children's pool, entertainment, baby / mini / junior club and baby changing room. 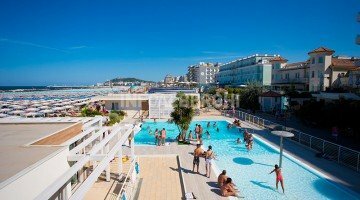 The hotel has an agreement with the beach n. 90 Malù, equipped with swimming pool for adults and children, Jacuzzi, sports fields for beach volley, beach tennis and beach soccer, table tennis, fitness area, daytime and evening entertainment, nursery toilets and hot showers. The beach also has an area equipped for dogs. List prices are per day per person, for a minimum of 3 days. The aforementioned prices are not valid on the MotoGP weekend. TOURIST TAX: not included in the price list. € 1.00 per person for 14 years for a maximum of 7 days from the eighth day is not paid. - Single room: € 10.00 per day.